we’ve done so many fun things with over the last year. do you remember these fun wrap ideas? we also snuck their soap into a shower gift kit and used some leftover paper for one of our toilet paper holder DIYs. today, they’re giving away an awesome set of 5 , 6 , and 6 ! this giveaway package is worth over $260! you would be set for housewarming gifts for awhile… or you could just hoard them all for yourself. we won’t judge. 1) visit the birch and goldberry and take a look around! one winner will be chosen on wednesday, may 29th at 10am PST. open to US only, sorry! It would be hard decide on which, but I love the wrapping paper! The Woodsman candle. Which I ended up buying while browsing. Whoops. Love the look of the Lychee & Fig Soap, so cute! loving the neon line of wrapping paper! but truly love it all! These are so pretty. It’s amazing what a little packaging will do. All of the soaps sound lovely! The Impressionists wrapping papers are really cool, I can even see making a party banner out of any of their papers instead of using them for gifts! I love the neutral wrapping paper – so modern and classy. Also loved what you did with the leftover paper! This soap not only combines some of my favorite scents, but I love the exfoliating feature. Also, it happens to match my bathroom decor perfectly. Win win. 3 of my favorite scents in one!! so perfect! I’d buy all the magnolia, fig, and white thyme candles! What is more fun than neon wrapping paper?! Those wrapping papers would make a gift look so special. The hibiscus, hyacinth & juniper candle sounds like it would smell DELISH! I love the Wrapping Paper Bundle because you can select 1 wrapping paper from each collection. The women at Birch and Goldberry are so sweet and wonderful! About a month or two ago, I ordered some goods from them, and they’re stunning! I love when the wrapping of a gift is just as beautiful as the gift inside! This sounds great! Also takes out the hard part of trying to decide which soap would smell best! I adore “The Neons” wrapping paper. The colors are so vibrant and it’s so unique that each roll is hand-painted. Gifts wrapped in this paper will be to pretty to open! Love the hand painted wrapping paper! Not only do I see it beautifully adorning gifts, but I also would love to use this paper to do some hand drawn lettering on top of to frame. A bit of everything bundle for a sampling of Birch and Goldberry products,please. The bit of everything bundle would be perfect for me. The soaps and the wrapping paper are both so beautiful, it would be difficult to choose only one. The soaps would be perfect for a mother’s day gift for my mom. The colors are just breathtaking! This sounds like such a great mix of scents! Would love to add it to my obnoxiously large collection of candles..
all the candles look beautiful! I love birch and goldberry! I have one of the cards displayed as art in my apartment because I love it and I love supporting local (Houston) artists! I want the Neon wallpaper!!! I’ve been obsessed with this wrapping paper for a while now! So fun! I would love to try all the soaps. Everything looks so nice and lovely! I would love their candles! This one sounds delightful! They have so much great stuff! I really love this wrapping paper: ! It would look lovely as art in a frame. The Woodsman Candle would be my pick – nothing smells (or looks) better than a lumberjack! Beautiful!! I love this bundle… it would be the perfect gift! My sister and I are both engaged and I will be DIYing most of both of our wedddings. These papers would be AMAZING! love the neutrals wrapping paper bundle! all of the wrapping papers are so fun! What a beautiful site! I love the sound of these candles: , , , and these soaps: , . we go thorough candles like crazy in our house. Usually we don’t afford fancy ones! It would be so fun to stock up on some good ones! I love these wrapping papers! LOVE there soap. It’s definitely an indulgence my budget does not currently allow for sadly. I love The Neons wrapping paper! I can’t get over how beautiful these soaps are! And I only wish I could smell the Lychee and Fig soap! What great products!! The Leather & Orange candle sounds particularly appealing! Because then you get a mix of neutrals and neon. All the candles sound like they would smell great, but I always go for the “woodsy” smell. So the Woodsman Candle it is! these papers are just awesome! I love the Impressionists Wrapping paper! Man, I’ve been wanting to snag “The Neons” wrapping set so I can frame each pattern and us it as art. It’s just stunning. Wow- I LOVE all the wrapping paper! Everything is so lovely, I want it all. That said, I’m going with The Neons! Can’t decide between the Lychee & Fig Soap or the Japanese Grapefruit & Osmanthus Sea Salt Soap! I would take any of the candles, but I am seriously IN LOVE with the neutrals wrapping paper! I love their beautiful paper! magnolia, fig and white thyme candle, that sounds AMAZING! Love the neutrals wrapping papers. I love candles and this one sounds like it smells sooo good! The colors and scents represented here are too good!! I would love to lather up that bar of honey nectar and orange soap, I can’t think of a better smell first thing in the morn! The wrapping paper is all so so good!!! Gorgeous! I love ALL the wrapping paper! I would definitely have to go for the Bit of Everything Bundle! How can you choose? Get a load of that Mandarin & Berry soap! Love the happy colors. Soaps! I want alllll the soaps! What a great scent combo! I love the neons and impressionist wrapping papers!!!! Everything looks so beautiful, it would be easy to hoard! The Lychee and Fig Soap looks great. everything looks awesome. but this card… love. I love the hand painted wrapping paper, and would not only use it for gifts for loved ones, but would frame a few pieces for decor. Magnolia, Fig, and White Thyme candle – yum! I would love A Bit of Everything Bundle! A Bit of Everything Bundle, of course! i can just imagine how amazing this candle smells! Um that soap bundle? yes please. In LOVE with the beauty of the impressionists wrapping paper!! Fingers crossed!! love the neons wrapping paper!! i love these wrapping papers! i’ve been obsessed with collecting wrapping papers lately. oooh this sounds so yummy! Ooh I love the Goji Berry candle & the Big of Everything bundle!! I’m in love with everything on this site, but the neon wrapping paper is my fave! Definitely jumping on the wrapping paper bundle train! Magnolia, Fig & White Thyme Candle sounds like a heavenly scent. I’m in love with these unique impressionist wrapping paper pieces! The neon wrapping paper is right up my ally. One of everything please! But seriously that neon wrapping paper is too good! LOVE The Neons wrapping paper! Getting so many project ideas for it. The wrapping papers are gorgeous! love the color palette used in these patterns! so pretty! ‘the neutrals’ wrapping paper set is too good! ah! the candles! who can say no to leather & orange. I would be ALL about that A Bit Of Everything Bundle! Soap, wrapping paper, and a candle? Yes please! The Neons Wrapping Paper is perfect! I would LOVE the leather and orange candle – I just know it! Love all the paper goods! The candles sound so perfect! I love all of their papers! I would love to try the magnolia, fig, and white thyme candle! the soap bundle looks like the perfect mother’s day gift! 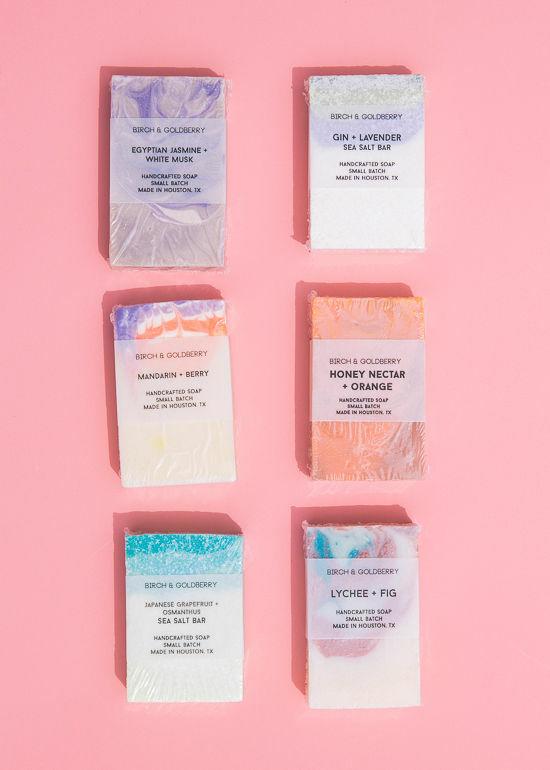 Would love to try this soap bundle! The candles all look amazing!! Gin and Lavender Sea Salt Soap? Yes, please. It has everything I want!! love the neons wrapping paper! Honey nectar & orange sounds like a heavenly mix! Honey and citrus, my favorites! Magnolia, Fig & White Thyme candle, please! I love the neutrals wrapping paper so much! I’d love to light this up in my office- sounds like a gettin-s**t done kind of scent! I am loving this wrapping paper! I imagine this would smell amazing! I want everything, but especially the Lychee & Fig Soap and the Woodsman Candle! I would love to try the Honey Nectar & Orange Soap – it sounds amazing! I bet the honey nectar and orange soap smells lovely! The GOJI BERRY, JASMINE & MINT CANDLE seems like it would smell amazing! Also the HONEY NECTAR & ORANGE SOAP would be a dream to use! The neutrals wrapping paper is so fun! Sea, fir needle, and bay leaf candle? Yes, please! This scent sounds divine! I love jasmine, and the mixture of that with goji berry and mint sounds intriguing. These hand painted papers are beautiful. The wrapping paper is too beautiful to wrap with! I’m a sucker for anything grapefruit, so it has to be the Japanese Grapefruit & Osmanthus Sea Salt soap! Sounds like a lovely not-too-sweet scent! I would go with the bit of everything bundle (lychee fig and mandarin berry soaps, 2 impressionist rolls, and the goji berry jasmine mint candle) since I can’t pick just one item. lychee and fig! I can’t imagine how amazing that smells! All of the candles sound delicious, but especially this one . Thanks for doing this giveaway! These neon wrapping papers are just gorgeous! The perfect way to dress up a gift. Everything is so beautiful, but I’m dying to smell the Orange and Leather candle. I imagine it smells fresh, a little bit manly, and really unique and wonderful! I love me some beautiful wrapping papers! This sounds like it would be amazing. the candles seem absolutely amazing. I can’t choose just one. The colors caught my eye, I think I would rather hang this up on a wall. I am also curious to see how the paint is able to stay on and the type of paper used. The neons wrapping paper. Reminds me of Lisa Frank! The “A BIT OF EVERYTHING BUNDLE”perfectly expresses exactly what I want. I’m a sucker for anything lavender!! I’d love a bunch of these candles for our new cabin in Topanga! I would love to get my hands on The Impressionists wrapping paper! Swoon. The Neons wrapping paper set is RAD! I only use lavender soap. I’m obsessed. But Gin and lavender??? Genius!! I have to try it. Love the neutrals warpping paper! Can you tell I have trouble picking?! Any of these would be fabulous. I have a thing for wrapping paper and these are just beautiful! The Neutrals one is my favorite- . I’d use it all year ‘round! WHAT!!! Ive been DYING to get my hands on some of their wrapping paper!!! I NEED!!! Been dying to try some of their soap for awhile. ooh call me a glutton but I love the little bit of everything bundle and $40 is such a great value! 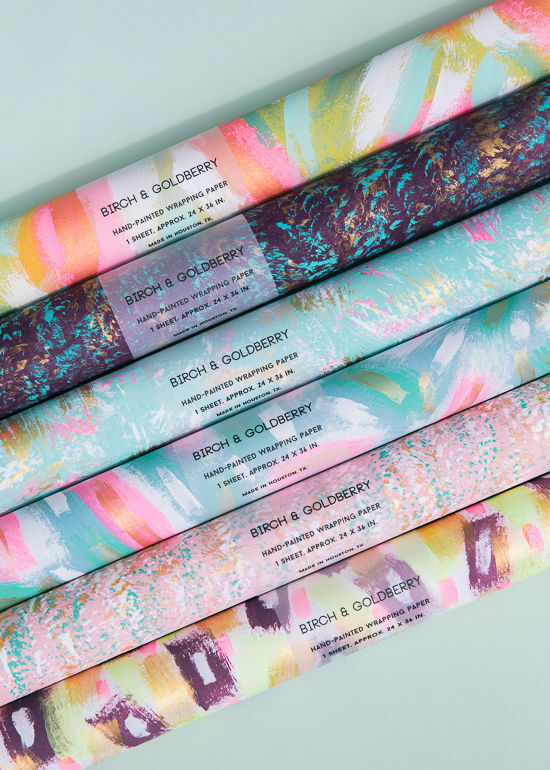 I haven’t been a DLF follower long enough to know about all of your collaborations with Birch & Goldberry so this company is new to me. I love the look of their colorful soaps and can almost imagine how good the Magnolia, Fig & White Thyme soy candle smells — mmm! The impressions wrapping paper is just too great! Love it! the candle scents sound so interesting, esp the woodsmen..
Loving everything on the site but I think the honey, nectar and orange soap will smell heavenly! Beautiful products. the lychee fig soap sounds divine! 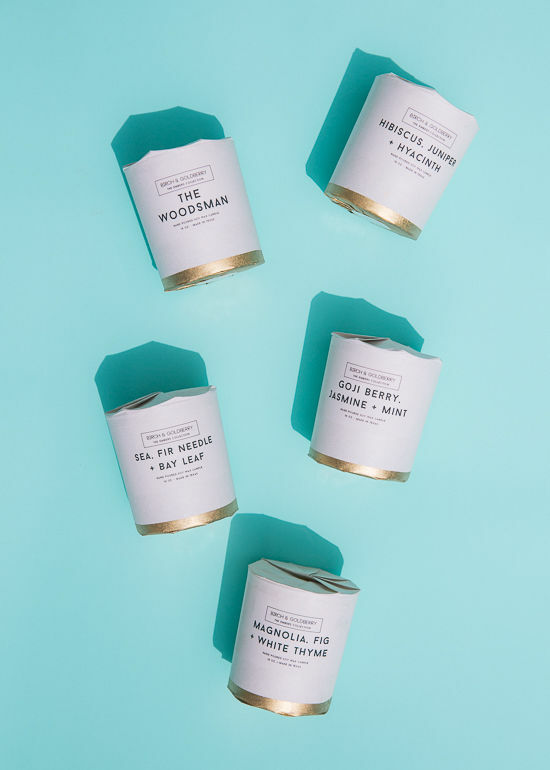 i want the woodsman candle! I love the “A bit of everything” bundle because it lets you sample one of each type of product they have! It’s just fabulous! Seriously, these candles sound amazing! I would love to try this soap! i am obsessed with these! loving the wrapping paper, i will for sure be using these in the future. I love Birch & Goldberry’s work! So much fun. I especially love their wrapping paper, specifically the Impressionists! Love these neutral wrapping papers… Gorgeous! This candle is my fav! I think this Magnolia Fig and White Thyme candle sounds amazing, but so does leather & orange. Can someone invent scratch n sniff websites please? My wrapping paper didn’t survive my move. I love to add this to my collection. They had me at Lychee. The Lychee & Fig soap sounds amazing! I’m liking the idea of the Sea, Fir, and Bay Leaf Candle as I love all three of those things! Thanks Bri! The impressionists wrapping paper. Just gorgeous! The Neons Wrapping Paper set is beautiful! I also would love to try that Lychee and Fig Soap! my favorite are the THE NEONS – WRAPPING PAPER. these are 80s fabulous! I love The Impressionists Wrapping Paper – all three rolls compliment eachother so well! the paper goods, especially the wrapping paper. so good. I love all the wrapping paper! Well, I’m pretty into the neutral wrapping papers, but this truly is a shop where I would happily purchase anything they have on offer for myself! This Lychee & Fig Soap looks like a work of art and that scent combo seems like it would smell AMAZING. beyond obsessed with the impressionists collection of wrapping paper. this mix of scents sounds amazing! Two of my favorite things combined into one. Oh my goodness! Love this giveaway! The Leather and Orange Candle sounds cool! I’d sure love to win ALL of this stuff! The soaps all sound nice, too. I would love to smell the Mandarin & Berry Soap! The marble effects are so beautiful! the whole website is basically to die for! Drooling over all the pretty paper and luscious-sounding candles and soaps! But, since if I had to choose one, I choose: , the gorgeous lychee and fig soap so I get the visual of the wrapping paper and the olfactory enjoyment of the candle! Soaps and candles are my favs to gift. Can’t go wrong with these fresh, natural scents. I want to smell this candle so bad! Im in love with the neutrals wrapping paper! Jasmine is my favorite smell, it reminds me of my grandma’s house. Trying to decide if I want to line the dresser draws or use as wallpaper in the closet! I love the impressionist wrapping paper! All these soaps just might be tooooo pretty to use. Jasmine and mint sounds heavenly! Mmm. I’d wrap empty boxes just to be able to share this gorgeous wrapping paper. Swooning! The leather and orange candle looks like my scent-sibilities. I’d also love to write some letters with that amazing stationary or make my own with the wrapping paper. The smell of the sea in my Midwest Apartment? Yes please! I love the neon wrapping paper! seriously so obsessed with these wrapping papers!!! I looooove candles and this one sounds like it would smell so dreamy! I would love this candle in my apartment! The mandarin and berry soap! Love these gorgeous wrapping papers! I think I’d love the Sea, FirNeedle & Bay Leaf candle. fingers crossed to win this infusion of mad color and scents! whoops, forgot to link: this candle’s scent combo makes my nose’s mouth water…. everything is so cute!! I would love the wrapping paper to brighten up my desk! The wrapping paper is soooo pretty! The Neutrals – Wrapping Paper is so lovely! Would be perfect for many occasions! This wrapping paper :0 gorgeous!! The honey nectar & orange soap looks divine! whoops! I think I left the wrong link. I would go for the Honey Nectar & Orange soap! I’d love to try the woodsman candle. The Honey Nectar and Orange soap seems like it would smell absolutely delicious!!!! Love everything but these are my fave! !